40 by 36 1/2 by 18 1/2 in. 101.6 by 92.7 by 47 cm. 32 3/4 by 20 3/4 in. 83.4 by 52.9 cm. 33 by 21 in. 83.8 by 53.3 cm. 23 1/8 by 18 in. 58.6 by 45.6 cm. 20 by 22 by 19 in. 50.8 by 55.9 by 48.3 cm. 18 1/8 by 23 1/8 in. 46 by 58.6 cm. 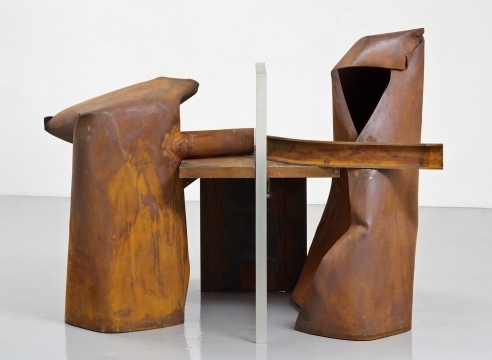 The exhibition features work spanning Caro’s sixty-year career and highlights the artist’s fearless and constant innovation throughout his lifetime. 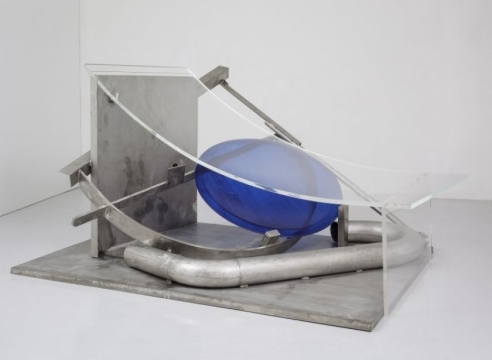 In Chelsea, six large-scale steel and Plexiglas sculptures from 2011 through 2013 will be juxtaposed against four colored paintings on paper from the 1950s, on view for the first time in the US. In the Madison Avenue gallery, four steel, bronze, and brass sculptures will be on view alongside a selection of gestural black-and-white ink works on paper from the 1950s. The exhibition will be accompanied by a fully illustrated catalogue with a new essay by Julius Bryant, curator of Caro: Close Up at the Yale Center for British Art (2012) and Celebration of the Life and Achievements of Sir Anthony Caro at the Tate Britain (2014). In an interview with the New York Times in 2007, Caro said, “I’m not interested in doing old things. I’m always trying to push it and see what happens.” True to these words, Caro constantly pushed himself to experiment with different sculptural materials until his death in 2013. 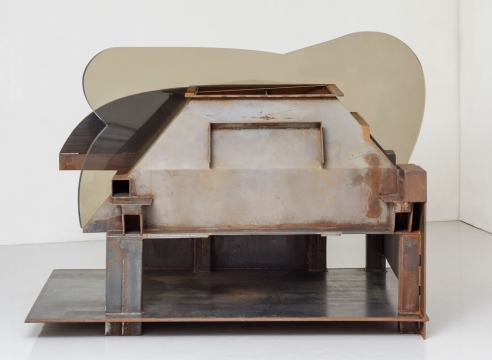 Throughout the 80s and 90s, Caro continued to introduce new materials into his work including silver, iron, bronze, brass, ceramic, terracotta, and wood. 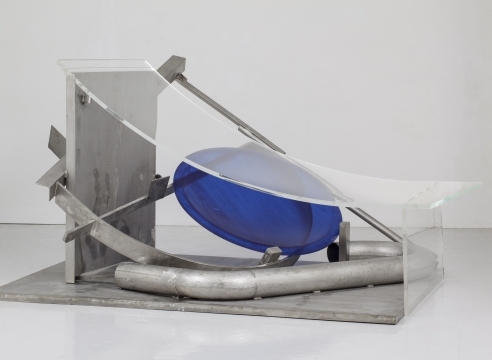 In 2010 at the age of 87, Caro introduced yet another new material: Plexiglas. 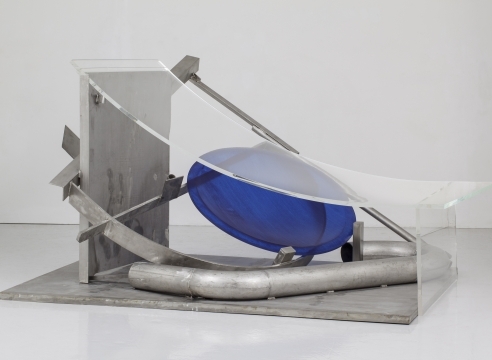 Frustrated by the fragility of glass, Caro turned to Plexiglas as a means to incorporate color and transparency in his sculptures. 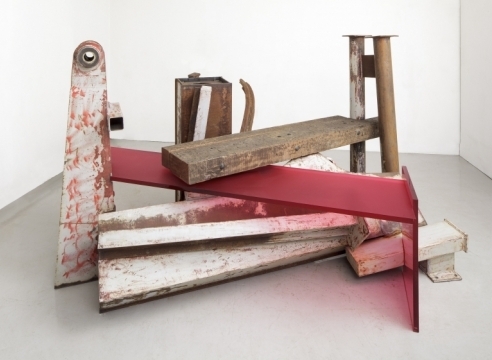 In Terminus (2013), part of the exhibition at Mitchell-Innes & Nash, a bright red piece of frosted Plexiglas bisects a steel and wood composition. The artificially colored red Plexiglas highlights the natural red of the rusted steel. Autumn Rhapsody (2011/12), in which Caro uses a striking yellow Plexiglas to cover and complement the painted yellow steel structure beneath, will also be on view. These colorful steel and Plexiglas sculptures will be displayed alongside equally colorful brush, ink, and paint works on newsprint. In these little known works on paper, black outlines of figures are filled in with blocks of color like stained-glass windows. Despite having been created more than 50 years apart, the formal and conceptual link between the colored works on paper from the 1950s and the recent Plexiglas sculptures is undeniable. In his catalogue essay for the exhibition, Bryant recounts visiting Caro’s studio in 2010 and studying the colored works on paper together. 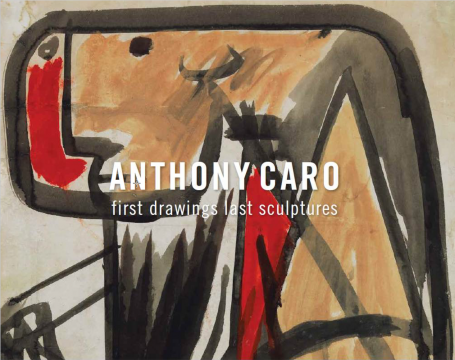 Caro, not having seen the works in years, was taken aback by his own early, and previously forgotten, drawings, and immediately remarked that he would use them as inspiration going forward. He began work on the Plexiglas series the following year. 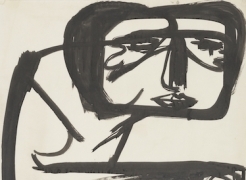 A similar dialogue between Caro’s works on paper and sculptures is examined at Mitchell-Innes & Nash’s Madison Ave gallery, with a focus on line. A selection of black-and-white drawings featuring expressionistically painted images of bulls and men, which were exhibited in Caro’s retrospectives at the Museo Correr, Venice (2013) and the Yale Center for British Art, New Haven (2012), highlight the linear qualities of the steel, bronze and brass sculptures on view. 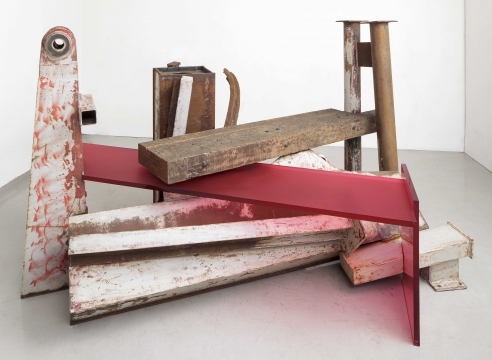 Ms. Mitchell-Innes first met Caro as a student when she worked in his studio in the 1970s and maintained a life-long relationship with him up until his death in 2013. The gallery’s first exhibition with the artist, in 2002, featured the Barbarians series, consisting of 6 large-scale sculptures of riders on horseback made from wood, steel and vaulting horses. She last visited him the week before his death when he was concluding the current body of Plexiglas work.